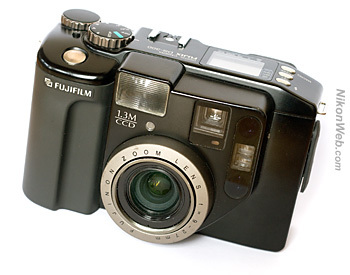 The Fujifilm DS-300 was announced in June 1997, with a �00 ($2500) price tag. I bought mine for �.99 from the usual source (eBay) in October 2006. The DS-300 uses the same 1.3 megapixel (1280x1000) sensor as the much more expensive Fujix DS-505 and 515 (aka. 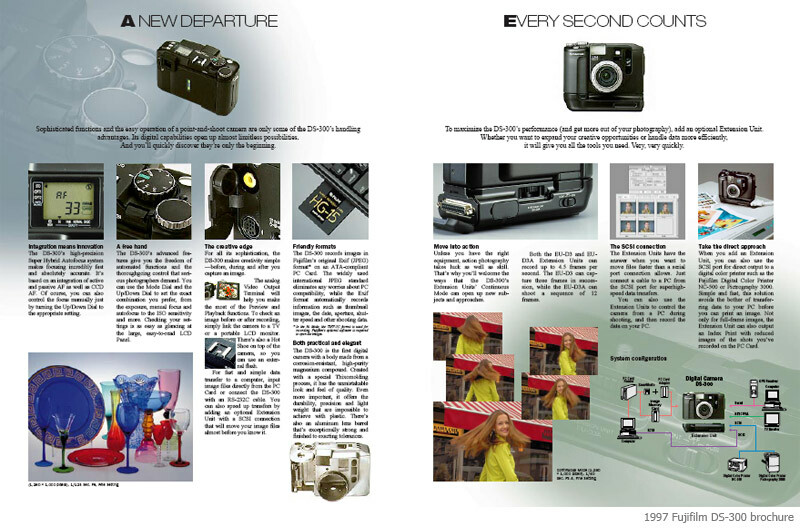 Nikon E2 and E2S) DSLR models (source: 1997 Fujifilm DS-300 brochure). It's also considered to be one of the first "affordable" professional digital cameras, which makes it interesting from a historical point of view. Physically, the DS-300 is considerably larger than the product photos would suggest. At least compared to later "compact" cameras. If you're not looking too carefully, the DS-300 resembles Fujifilm's own medium format rangefinder cameras. It's a handful, but I like it. Like other early digital cameras, the DS-300 doesn't have a LCD monitor on the back. In the field, it's like shooting film. You won't see your photos until you get back home and put the PCMCIA memory card in the computer. Conveniently, the photos are stored as standard JPEG or TIFF files, making them easily accessible more than a decade later (unlike the proprietary files crated by some of the early digital cameras). 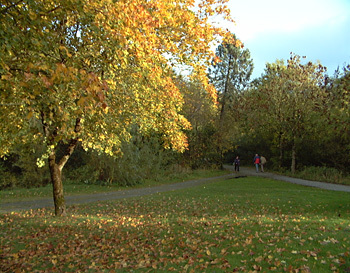 Most of my DS-300 JPEG test files are approx. 325 KB. 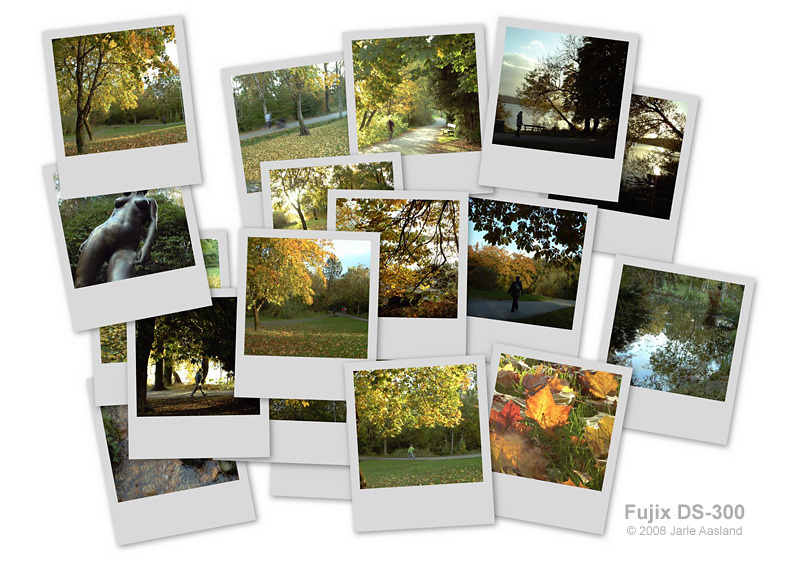 Regarding memory, the easiest solution is obviously to use an original Fujifilm (or Nikon) Flash ATA PCMCIA card (e.g. 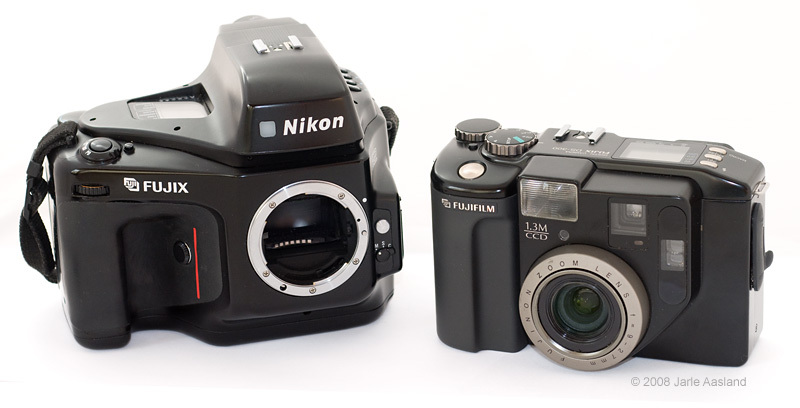 Nikon EC-15 or Fujifilm HG-10). But - if you're feeling lucky - you can also dig out your old Compact Flash cards and test them with a PCMCIA adapter. I've tried a handful of old CF cards. Much to my surprise, the only one that worked was a newer (relatively speaking) 128 MB TwinMOS card. Older 16, 32 and 80 MB cards didn't. The contemporary reviews are mostly very positive about the DS-300 image quality. "Simply stunning", wrote one reviewer. "Considering everything, image quality is very good", wrote another. More than 10 years later, image quality is less impressive. No surprises there. Admittely, I haven't bothered testing the TIFF output. The normal and high quality JPEG's are pretty good, especially considering that this is a first generation digital camera, but the images looks best when downsized a little. But with only 1280x1000 pixels you can't afford to throw many of them away.. Outdoor colors are generally pretty accurate and nice, but indoor shots are typically too warm (with a yellow/red color cast). The camera has a non-removable 9-27mm Fujinon lens (equivalent to a 35-105mm lens on a 35mm camera), with the following apertures: f/3.5, 5.6, 8 and 11. I have a feeling that the camera's sensor can't do the lens justice. The standard ISO setting is 100, but there's also a "High" 400 ISO setting. In the field, the DS-300 is suprisingly good (again, considering its age and obvious limitations). The camera is very responsive compared to most other of the early digital models. You can also mount an external EU-D3 extension unit, which offers continuous mode shooting (4.5 fps, but only 3 frames..), direct printing and a SCSI connection (D-sub 25-pin) to a PC. My camera came with one of these. Don't need it, but it looks pretty cool. As if this wasn't enough, the manual even states that the DS-300 can be connected to a GPS, to record longtitude and latitude. This was 1997. Amazing! Undoubtedly, the DS-300 was labeled a "professional camera" for several reasons. You can shoot completely manual (M), in aperture (A) or shutter (S) priority mode, in addition to fully automatic (P and AUTO). You can also mount a real flash in the camera's hot shoe, a rare option with early "compact" models. The optical viewfinder is less than perfect (to say the least), but does the job. Changing many common settings is frustratingly awkward (probably easier with more experience), but the camera still has a nice feel to it. A little plasticly, perhaps, but nice. And, I almost forgot: Battery life seems to be very, very good. 800 exposures with a fully charged NP-510 battery pack, according to the manual. Once again: amazing! Since many eBay sellers frequently link to these pages when auctioning old cameras, I'll add the following advice: If you're considering the DS-300 for real world use: Forget about it. Don't be fooled by the original price tag. This was cutting edge technology some 10 years ago (in the late 1990's), but not any more. Do yourself a favour and buy a modern camera instead. On the other hand, if you're a photography/technology nerd/collector this is a cool camera to play with. Find a cheap one and have fun!